In 1940 Lyricist Max Brod and Composer Marc Lavry collaborated on the oratorio Song of Songs. 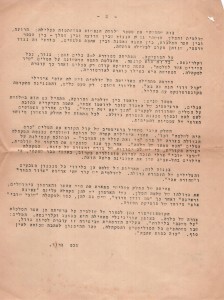 In 1942 Brod wrote an article about his crafting of the text. 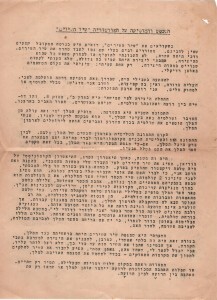 The images are of the original Hebrew article he typed and sent to Lavry. When reading the book of “Song of Songs”, one can see that the original version has sections that are not to be understood. Many renown poets have tried to rewrite Song of Songs. My approach was different. I did not intend to add or delete any sentence from the book. My love for the text was always so great that I did not dare to introduce any inherent changes to its essence. I did only one things: I radically changed the order of the sentences. The work, as I perceived it, starts in chapter II, verse 8. This is a dialogue between a shepherd and his beloved Shulamith. Both are happy. The description of spring in our country [Israel]. The second scene is the disorder. The King appears in “Who is this coming up from the desert” and Shulamith is beautiful in the king’s eyes. He requests her to dance before him. The King’s men forcibly kidnap Shulamith and bring her to the palace in Jerusalem. The third scene is at the women’s palace of King Solomon. Between this picture and the third composer Lavry introduced a beautiful introduction that depicts the glistening palace of the king. Despite the story being adverse to the king, his court charms the people with its rich colors. It was a mistake when the Prague Communist Theater of Burien presented my interpretation of Song of Songs as a revolutionary play. In that performance they depicted Solomon as a dictator who appeared in the chapter. The play was performed in this manner without my consent. I think that Lavry properly understood my interpretation. He presents to us two worlds: rural life and the lives of the royal court. He expresses both worlds via their true colors and their contradictions. The simple love in the village can be heard in tender tunes, which resembles those from Yemen, folk songs and biblical melodies. The lavish royal court is depicted by the sound of a full orchestra and a grand chorus. Solomon’s wives gather and bless Shulamith. They try to explain to Shulamith how much happiness will come to her upon her acceptance at the king’s palace. They talk as if they were slaves. Yet Shulamith does not hear nor see all the beauty around her. She longs to the poor shepherd in the village in “I am my beloved’s, and my beloved is mine”. Shulamith runs away at the dead of night. The guards catch her and beat her up. These words clearly emphasize an escape from a king’s court to the birthplace, to the simple environment, to a mother’s home. My hypothesis is that the intention of Song of Songs was first and foremost against the king. It was obviously impossible to put it in the Holy Scriptures this way. But our elders loved this song so much that they did not want to give it up. I can imaging that one of them, a true genius, suggested to break the song into sections and reorder the verses — to obscure the intent that was hostile to the king. Tradition always saw only two figures in the plot instead of three. It is possible that the love words intended to the shepherd were perceived as being towards the king, or that they saw only the love between a shepherd and a shepherdess. By updating the number of the personas participating in the plot to three: the shepherd, Shulamith and the king, I also updated the contrast between the shepherd and the king — between the countryside and the royal court, between true love and the lust of mistresses. It’s certainly a dramatic contrast, one that provides a stage to thrilling plot. The opening is arranged for three instruments: violin, harp and clarinet, in Cadenza form. The first theme emphasizes the words “The Song of Songs, Which is Solomon’s”. This theme first appears in the orchestra and then moves to the choir. The opening is like a caption to the oratorio. 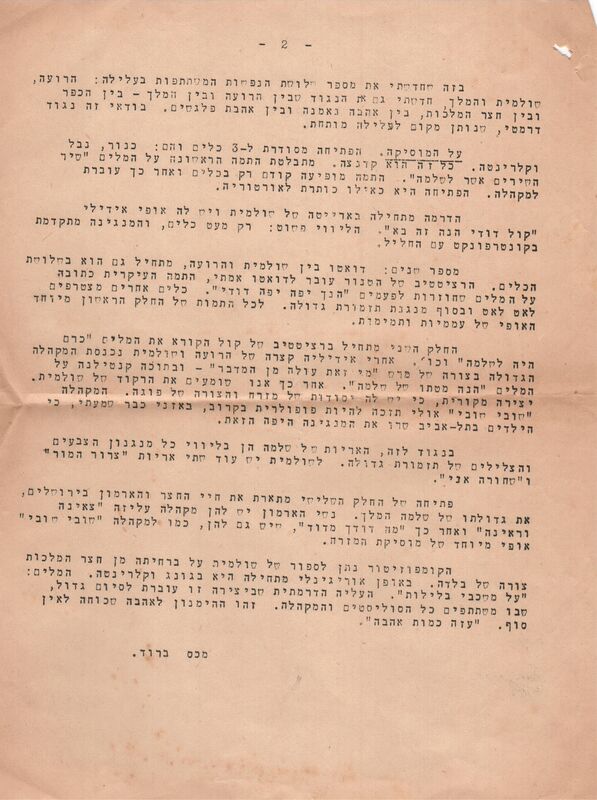 The drama begins with the Shulamith’s arietta “The Sound of my Beloved! Behold, He is Coming”, which has an idyllic character . The accompaniment is simple: only a few instruments, and the melody advances to a counterpoint with the flute. Number two: a duet between Shulamith and the shepherd, also begins with the three instruments. The recitative of the tenor evolves into a genuine duet, and the main theme is based on the repeating words “Behold, You are Comely, My Beloved”. Other instruments gradually join and eventually the full orchestra plays. All the themes in the first part share a unique character of folklore and innocence. The second part begins with the recitative of a voice calling his words “Solomon Had a Vineyard” etc. 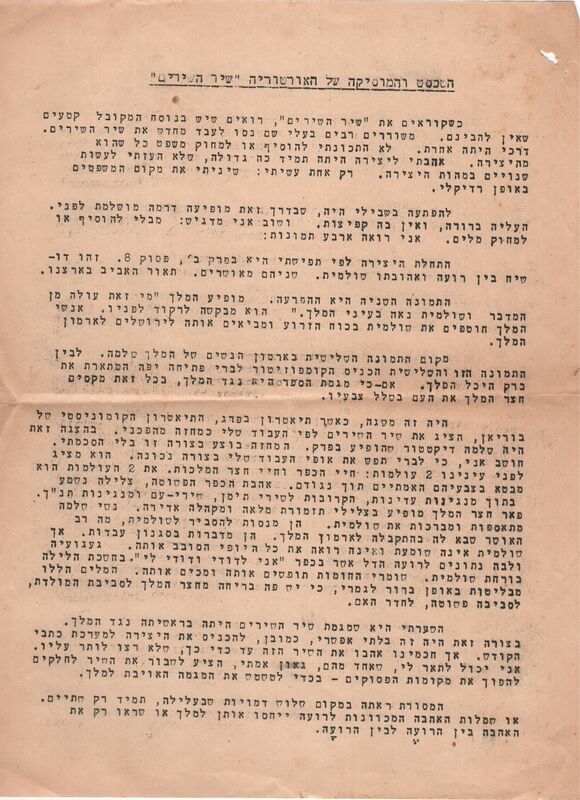 After a brief idyll between Shulamith and the shepherd the great chorus joins in a form of march at “Who is This Coming up From the Desert” which includes a cantillation on the words “Behold the Litter of Solomon”. Then we hear Shulamith’s dance. This is an original work that has elements of the oriental music in a fugue form. The chorus “Return, Return” may soon be popular. In my own ears I’ve already heard children in Tel-Aviv sing this beautiful melody. In contrast, Solomon’s arias are accompanied by a complete range of colors and sounds of the full orchestra. Shulamith has two more arias. “A Sachet of Myrrh” and “I am black“. The opening of the third part describes the life of the court and palace in Jerusalem, the greatness of King Solomon. The women at the palace have a cheerful chorus, “Go out, O Daughters of Zion, and Gaze”, and later “What is Your Beloved More than Another Beloved”, that, like the chorus “Return, Return”, has a unique flair of oriental music. The composer gave the story of Shulamith’s escape from the royal court a form of a ballade. It begins, in a novel way, with the gong and clarinet. The text is: “On My Bed at Night”. The dramatic plot progresses to a grand finale, with the participation of all soloists and the choir. This is the hymn to endless love. “Love is as Strong as Death”.